Summer reading is great! Use these sheets for books or TV time. Originally posted February 2013. The other day, Oscar and I were reading a Fly Guy book on our Storia app and we decided to click on an interactive feature at the end of the book. We were asked 3 questions about the story and given multiple choice answers. Oscar loved answering the questions and I was amazed at how much he retained from reading through the story. He is 4 years old and the days of sitting at this very table doing homework are not that far off. As much as I love technology, I am always looking for ways to bring it back to the table with tangible object lessons. Call me old fashioned, but I still love the smell of a new box of crayons and a fresh piece of paper. I started to think of ways I could sneak in some comprehension exercises throughout the week and I decided to bring the best of both worlds together with TV/reading comprehension worksheets. Since so many shows are educational (thank you Cat for teaching us how to make chocolate!) I thought it would be a great way to bring it home. 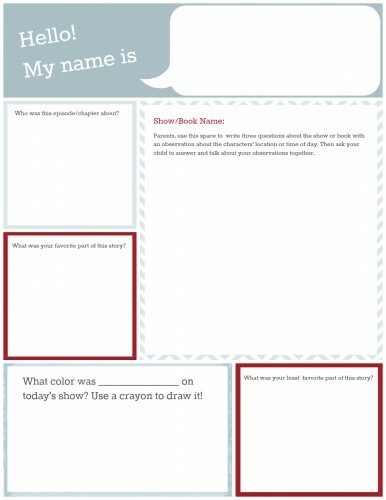 And if your child is super into the activity, you can follow it up with printables from the show’s website, like these from PBS Kids. Here’s the plan: On the days where Oscar watches television (which is usually Mickey Mouse Club or Cat in the Hat) I’ll grab a worksheet and come up with a few questions based on the show. It’s hard for me to get him to do anything that requires sitting at the table or even remotely resembles a worksheet. But my hope is that by discussing a show he just watched or a book he just “read”, we might be able to get into a nice routine. We tried it out yesterday with the movie Toy Story 3 (a favorite in this house). He was reluctant at first, but I tried to follow his lead and eventually he got excited about my questions! Yay! Here’s to many more fun recaps of our shows and books. Feel free to print and use our worksheet below! The idea is not to pressure him for right or wrong answers, but to get him comfortable with the idea of making observations, retaining information (not hard for him – his mind is a steel trap) and talking about what he learned. These sheets will work for television or books. Don’t forget that Saturday is Read Across America Day. So grab a few worksheets and enjoy your reading! Want more? 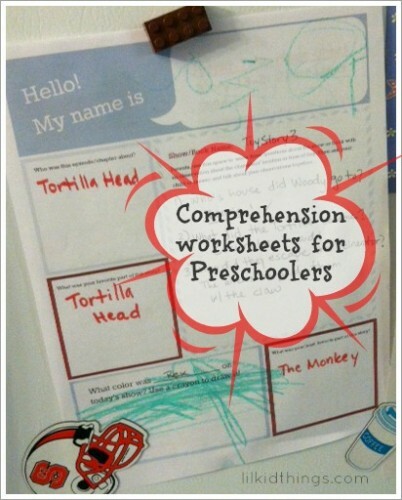 I have other tips and activities for preschoolers! Too Tired to parent: Is Balance a Myth? I will pass these along to our daughter, mom of two – a 4 year old and a 1 year old. Thank you for your service to parents.